It is patient and kind. It is not proud, is not self-seeking and does not dishonor. Last week, I got a chance to personally experience the OSIM uLove Massage chair over at OSIM Building. Really honoured and elated to be part of this exciting event! Not only I got to witness the unveiling of the OSIM uLove Massage Chair, we got a chance to have a 30 minutes personal experience with the massage chair (in the dark mind you! ), take a little tour at the OSIM building checking out the entire colour range for the OSIM uLove Massage Chair and had a taste of some really yummy cocktails/mocktails and desserts! The cocktails/mocktails tasted AMAZING I swear! And they look really interesting! Massages are always paired with yummy-smelling/soothing essential oils! All the way from London, Neal’s Yard started over 30 years ago with the belief that consumers should understand their rights to know what goes into the products they buy. Proudly producing and selling organic products, they stand firmly against the synthetic chemical approach to skin and health care. Promising us users that we will be romanced by this not-just-a-gorgeous-looking massage chair, the OSIM uLove 白馬王子 brings massage innovation to a whole new level. 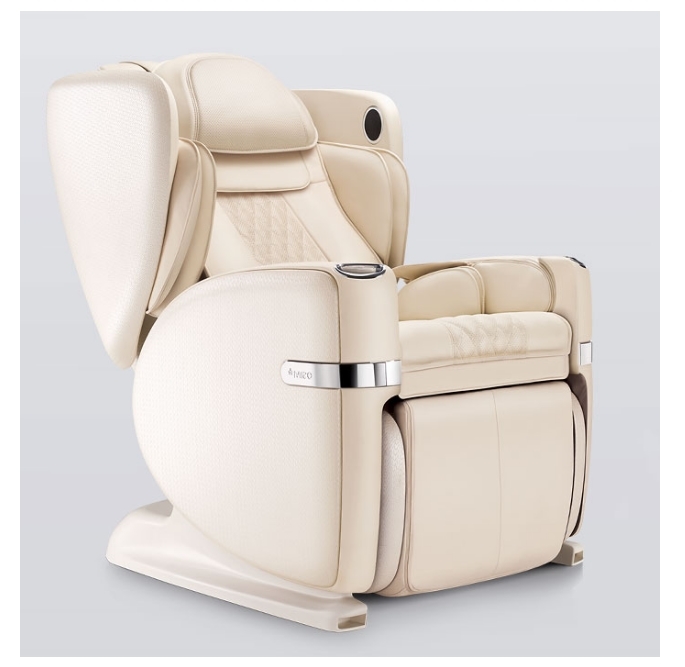 Pampering us with massages from mind to body, head-to-toe,the OSIM uLove is said to be the world's most pampering massage chair that consists of three elements to deliver an outstanding experience to help achieve total relaxation of the mind and body. In 5 different colours, Dashing Copper, Dreamy White, Gorgeous Teal, Charming Red and Handsome Brown, the OSIM uLove 白馬王子 features a timeless design that shouts so much elegance and class. Let's take a step further to talk about some wonderful features the OSIM uLove massage chair has! For this massage chair, OSIM cleverly positioned the sound speakers within an intimate chamber so that users can experience an enriched and immersive virtual audio effects. The V-Hand Massage Technology that the OSIM uLove has is said to mimic the hand-grip of a professional masseuse to make our massage experience more realistic and pleasurable. With 720º Roller Balls, the V-Hand Massage is able to rotate 360° in both horizontal and vertical directions to intimately roll along every contour of your body ensuring total relaxation and contentment. Also, with its extended massage track, long track massage reaches every inch and bit of our bodies from head down to our butts. It promises to target more pain points for more satisfaction. With a broad range of massage programs that are professionally designed and tailored to satisfy the needs of the entire family, the OSIM uLove massage chair gurantees that everyone's experience will be precise and targeted to effectively help relieve and enhances well-being. * Rejuvenate calves, ankles and feet - this was my favourite! Do you know that you can constantly download an ever-expanding suite of new lifestyle massage programs to satisfy the diverse needs and well-being of the whole family with just a simple Bluetooth connection to your smartphone?!? This range of Lifestyle Massage Programs promises to continue to expand so as to satisfy the diverse needs of everyone! Also, the foot massage unit can be adjusted to suit our respective heights!! The clever Osim uLove massage chair is able to save up to 3 preferred massage settings for greater convenience! You are now also able to save up to 4 of your favourite massage programs for quicker selection and easier navigation in future. After my experience with the OSIM uLove 白馬王子, I admit, I'm pretty SOLD. Thank you for having us, OSIM Singapore! It comes with a one-year warranty and free delivery! I am very health conscious. Care about health is important think. Now people are conscious but only about their beauty. They are not caring about their internal organ that's why they suffering from ankle,knee problem. Use foot massager machine for relieve from this type of pain. I tried the best massage chair at my friends home, and I felt deeply relaxed after using it. Now, I am planning to get one for me very soon. I've have Irobotic model from Lucaro, Chose it because it was made in the USA. Here you can read reviews at http://www.wellnessgeeky.com/massage-chair. I am planning to buy a massage chair and I am confused because there are lots of options are available but after going through your article I am done. Personally, I own an Osaki Massage chair but after reading your detailed article about Osim, I feel I am in love with its features. I hope to get one for myself, if it's available in USA. Here’s a guide about choosing the right chair. I feel like adding Osim to the list.